Here’s a way to get a week’s worth of disaster supplies for less than $50. Use these frugal shopping tips, checklists and food calculators to ensure you are prepared for the next disaster. Preparing for disasters can be costly if you have to purchase everything at once. Many preparedness enthusiasts prefer the less stressful route in prepping a little at a time. That said, our monthly budgets sometimes do not allow for expensive, top of the line purchases. That’s when you have to get creative. When my family rode out the aftermath of Hurricane Ike in 2008, we were off the grid for two weeks and used many emergency items purchased from the Dollar Store. At the time, we were paying off lofty debts and didn’t have the money to buy brand name items. Many of the items I purchased, I outlined in the first week of 52-Weeks to Preparedness, but there are many more Dollar Store finds that I wanted to list today. Below, are thirty prepper-related items you could easily find at your local Dollar Store or Dollar Tree. The listed items are supplies for one person, so if you have other family members to consider, multiply some of the supplies by the amount of family members. This calculator could serve as a starting point for items you may want to keep an eye out for. 3 non-perishable items such as saltine crackers, graham crackers, oatmeal, granola bars, pasta, etc. Items on sale – Go for the deals. Larger sized canned goods generally have better deals. The purpose of this article is to show you that you don’t have to break the bank to prepare for disasters. 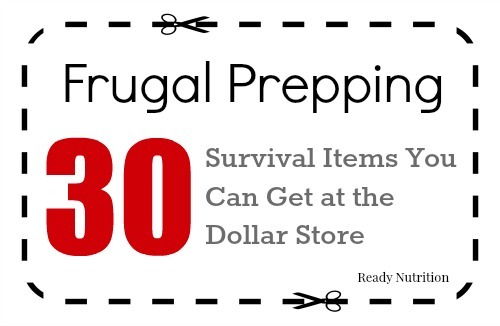 These frugal shopping tips, checklists and food calculators can help you pay less than $50 for a week’s worth of prepper supplies. In a lot of dollar stores you can find large candles in glass vases. Buy those instead of crisco. Much more shelf stable at room temp. Epriration date? Really? Most prepper so know that expiration date mean nothing. expiration date mean nothing? Ever heard of diarrhea hot shot, not good in a SHTF situation! Google it dipstick. Expiration dates are when the food is past its peak of freshness. If the can is not dented, damaged, or bulging, open it and give it a snif test. If it passes chow down. Food from a civil war sunken paddle wheeler was tested after 100 years old. Found nutritious enough to sustain life. Go learn how pressure canners work. Canning you own food is good for you. It save you money too.